WANT TO SEE WHAT WE DO FIRST HAND? We are now giving walking tours of Lloyd EcoDistrict! Guided by Lloyd EcoDistrict staff, our tour highlights some of the great work our partners and neighbors are doing to make Lloyd a healthier, greener, and more connected community. Join us for a well-paced walk as we visit green roofs, bike lanes, water treatment systems, and LEED buildings. We are happy to adjust our stops and tour script to meet the schedule and interests of your tour group. 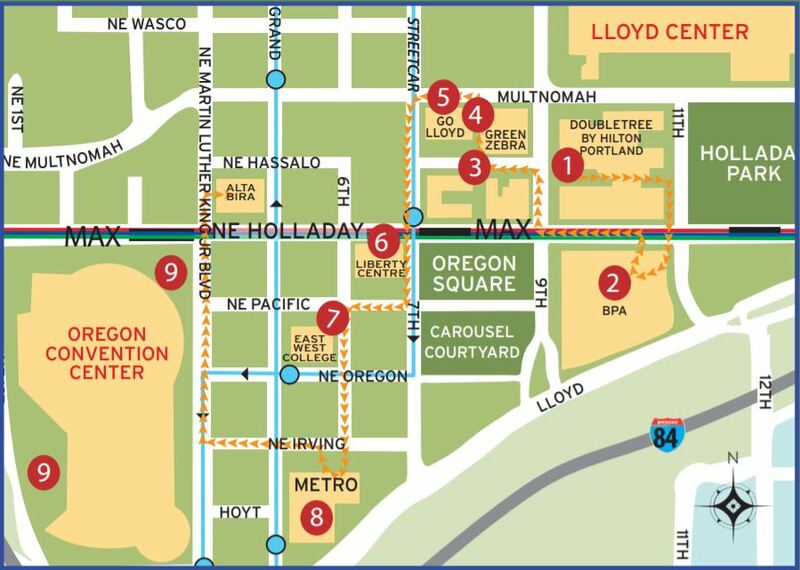 Walking tour map of Lloyd EcoDistrict. Check out http://www.golloyd.org/walking-maps/ for map neighborhood walking maps. Contact Brian at brian@ecolloyd.org to schedule your tour today!